The Diamond Room is home to some of the biggest progressive jackpots, and this weekend you'll enjoy a Buy One Get One Free ticket offer that could see you landing one of them! The offer runs on all games, all day Saturday and Sunday - and don't forget that the big bonus of BOGOF is that you're even more likely to win the progressive jackpot which is just what everyone needs in January! So forget the sales, and join them in Diamond for BOGOF Bingo - a bargain in anyone's books! Bingo Mayhem is only 10p per card and has a minimum guaranteed prize of £15 and the 90 Ball Progressive Jackpot up for grabs in 38 calls or less! And if you buy 10 cards they'll also give you 2 extra, absolutely free! They will be mayhem in the chat room as players strive for the progressive jackpot. You'd be crazy to miss these great games, and to ensure you never have to you can book your tickets now. BOGOF, Buy One Get One Free, Two for the Price of One… Whatever you decide to call it, the message is the same – They give you a free bingo ticket for each ticket you purchase! Each card you buy, you get another one free. This offer takes place in both the 90 ball and 75 ball bingo rooms. In the Lilac Lounge, BOGOF hours are between 7am - 8am, 1pm - 2pm and 10pm - 11pm. In Bingo Fiesta games take place between 11am - Midday and 4pm - 5pm. SPECIAL BINGO TREATS: Play in 90, 80 & 30 ball bingo and give yourself a special treat. Jump straight into July this weekend with BOGOF Bingo in the Bejeweled Bingo room! This means not only will you have twice as much fun but also double the chances of winning the Progressive Jackpot! Simply buy at least one ticket to a Bejeweled Bingo game on a Saturday or Sunday in July and they will give you one FREE ticket for every one you purchase. And that's not all, whoever buys a ticket for every BOGOF promotional day, each weekend, will be entered into the Bejeweled Bingo Prize Draw at the end of the month to win an exclusive Bejeweled branded Ipod Touch! So with twice as many tickets you have double the chances of winning so join them for a brilliant bargain in Bejeweled Bingo every weekend! Join them on Thursday evenings in the Disco Divas room where they drop the card price in ALL games to just 5 pence! And what's more, they give you 6 FREE cards, with every 6 you buy! Plus when you bingo in 43 calls or less they give you an extra £666 jackpot! Buy 6 Cards and Get 3 Free! They are bringing you the first ever Buy 6 Cards and Get 3 FREE Promotion starting on Friday February 1st in the Valentine's Bingo Room! This promotion will be for all pari mutuel games playing from 6pm ET until midnight every day! All you have to do is select a total of 9 cards of your choice and you'll only be paying for 6 and it doesn't end there! You can buy 12 cards and get 6 FREE, you can also buy 18 cards and get 9 FREE and the list goes on! Give this promotion a shot, Buy 6 Cards and Get 3 FREE! It is BOGOF at Zingo Bingo! The Buy One Get One Free Cards are here. All week long until February 10th, 2013 two hours a day for 90 ball and 75 ball bingo. Join the Lucky Stars Room – 10am to 11am and Golden Balls Room – 8pm to 9pm. In a new promotion, they are offering players Buy 6 Cards Get 3 Free every day from 6pm ET until midnight on all single part pari mutuel games! Simply select a total of 9 cards of your choice and you will get 3 out of the 9 for free! You can select more than 9 cards - you can buy 12 cards and get 6 free, or even 18 cards and get 9 free. Starting from Monday April 8th they will be offering a Buy 6 Get 3 Free Promotion for all Classic Bingo Games. This offer will apply to all bingo games played in this room except between the hours of 12pm ET and 4pm ET. Purchase 9 cards and you'll receive 3 free! Join the Classic Room and take advantage of the Buy 6 Get 3 Free Promotion! 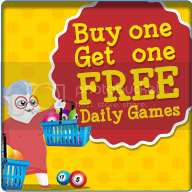 Double your bingo cards for FREE to double your fun. Get daubers at the ready because they’re giving you buy one get one free Bingo tickets all weekend! BOGOF Value Nights!!! 2 hours each night, 6-8pm, Monday - Thursday! Buy 5 Get 5 free and only .01p - .05p tickets!! 90 ball bingo under the Specials tab!!! A BOGOF TO GO FOR! Visit Victoria 90 and Big Ben rooms and you may come out rich!